Winding roads, exquisite pastoral scenes, ancient architectural gems, and beautiful beaches are often a short distance from the major cities where we spend our days and nights. Sometimes the most difficult thing about deciding on a day trip is determining which direction to take. Whether you’re after incredible historical sites, wide open spaces where you can simply breathe deep, or the perfect pub fare, these undiscovered travel destinations are certain to please. Where: 2 hours from Liverpool. Click here for a map of the exact location. As you travel through rolling hills dotted with fluffy sheep, you are likely to feel your stress evaporate a bit. 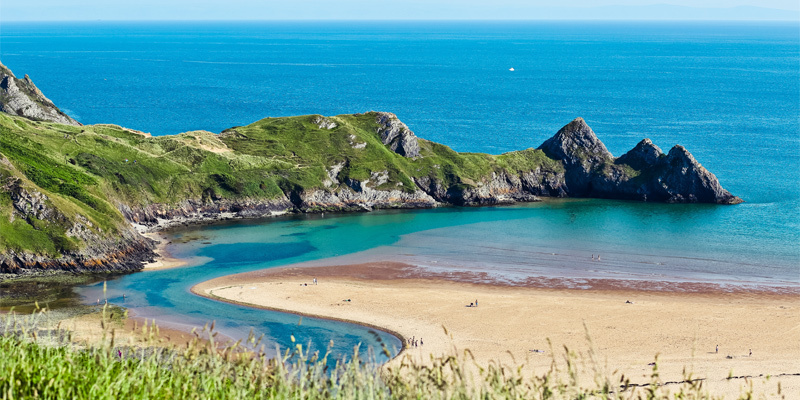 When you reach the coast, with its many scenic coves, soaring cliffsides, and clear blue water, you might forget that you’ve just travelled to Wales. Llŷn Peninsula is easily one of the sunniest getaways Britain has to offer, with clean expanses of sandy beach ruggedly outlined by incredible rock formations or more gently embraced by softly rolling sand dunes. This wonderful getaway is just about two hours from Liverpool, which is easily accessed via air from most places in the UK. So depending on your location, the scenic hamlets and seaside scenery of Llŷn Peninsula could be just a few hours away. Where: 2 hours from Leeds. This old smuggler’s hideaway is under 2 hours from Leeds, but it’s like a postcard from another time, complete with cobblestone streets, quaint storefronts, hidden stairways, and pantiled rooftops everywhere you look. Along the way, you’ll discover lots of stories concerning the smuggling of goods such as brandy, rum, and even tea through tunnels right underneath the town. Even though this ancient village is a small one, there are incredible sights at every turn. A tour guide can take you to the old tunnels or show you the 15-mile smuggling route that extends across the moors. You can, of course, wander many scenic spots freely on your own, including rocky tidepools that will surely build your thirst for one of the local beers, which often feature quaint names inspired by the town’s famous smuggling activities. After hours, you’re likely to find live music or even comedy at one of the many hidden venues. While you’re here, be sure to travel to nearby Whitby Abbey, which dates back to 657 AD. It’s just one of many cathedrals and abbeys along Yorkshire’s coast. Offering 95 scenic miles of exquisite oceanfront, the Jurassic Coast winds its way from East Devon to Dorset and back again, with dozens of villages and towns to explore along the way. 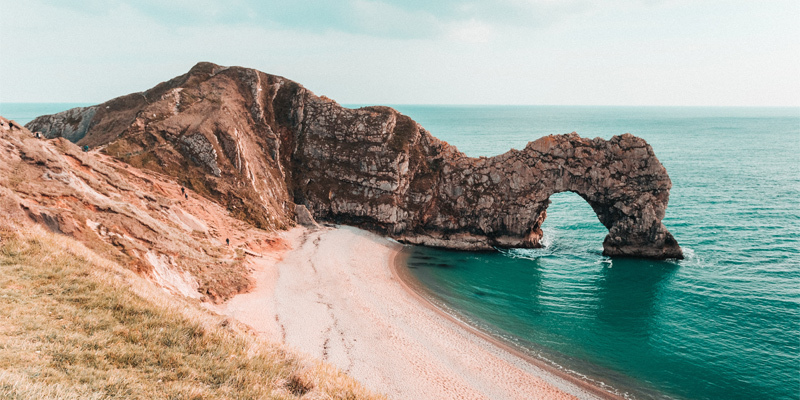 Stop to photograph Dorset’s Durdle Door arch and walk the sands of Lulworth Cove, and be sure to take a closer look as you explore! 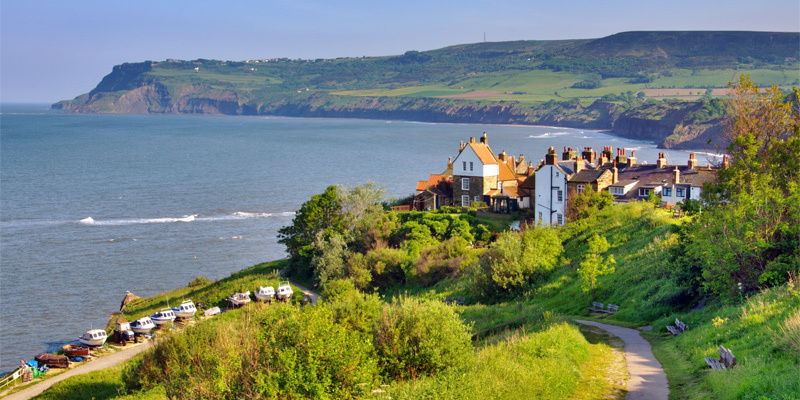 The Jurassic Coast gets its name from the many fossils found here and as a UNESCO World Heritage Site, it’s well worth a few leisurely days spent walking or cycling between trips to museums, visitor centres, and other attractions. Accommodations tend to go quickly during the high season. Whether you choose a hotel, B&B, camping, or self-catering, it’s a good idea to book ahead. If you’ve been looking for a kid-friendly getaway, this is by far one of the best. It’s just 40 minutes from Bournemouth, so multiple visits might be in order. On arrival at Applecross, you might just think that you’ve entered another world. Pebbled beaches and long stretches of white sand front green hills and water reflects sky in a way that’s sure to take your breath. 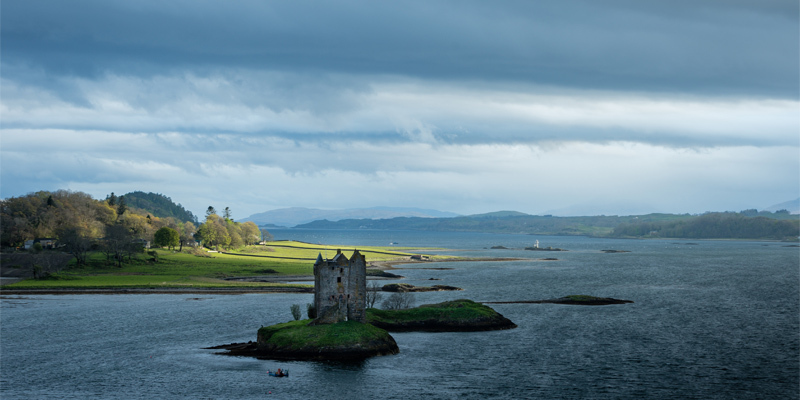 Only a Scottish Highlands fishing village feels like this, and once you try the food you might consider a longer stay. On the drive to Applecross, you’ll have the opportunity to visit Bealach na Ba Viewpoint and some other famous vistas. Many of the roads to Applecross are singletrack, perfect for slowing down a bit and enjoying mindful exploration. At just 2 hoursfromInverness, this scenic destination is close enough to require minimal effort but distant enough to feel like you’ve managed to get away from it all. Up for a trip to the Cotswolds? 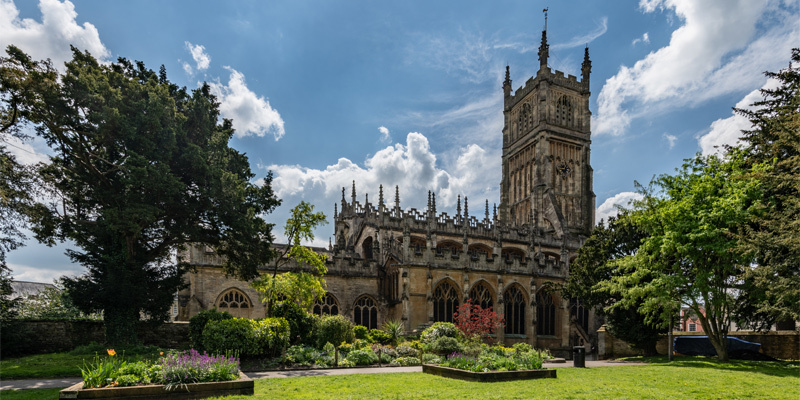 Even though Cirencester is the so-called “Capital of the Cotswolds,” it is neatly tucked away from busier spots, just a short distance from Bibury and its fabled Arlington Row. Picturesque stone cottages, larger manses covered with trailing ivy, romantic bridges, and verdant fields await, along with delightfully cosy pubs filled with memories of yesteryear. Try the Falcon for delicious food at good prices. Cirencester is just an hour from Bristol, yet it’s often upstaged by Cheltenham. Not to be missed: Cirencester’s second-century Roman amphitheatre, along with the Corinium Museum, which holds a treasure trove of Roman artefacts including one of the most incredible mosaics collections on display anywhere. St. John the Baptist is a wool church with old Abbey grounds that belonged to an Augustinian monastery that was demolished in 1539. A picturesque Norman archway remains as the lone reminder of the abbey. Easily one of the UK’s prettiest towns, Shaftesbury is just about 30 km from Salisbury and an hour from Bath, Southampton or Bournemouth. As if a trip through Dorset’s countryside isn’t enough, this old market town is a scenic destination, complete with indoor attractions such as the Gold Hill Museum in case the weather turns. Should you visit on a chilly day, you might want to enjoy lunch at The Salt Cellar, where you’ll find homemade soup, incredible meat pies, and more. Shaftesbury dates to Anglo-Saxon times. The old abbey was demolished in 1539, but you can still see St. Peter’s Church, which dates to the 15th century. Most of the historic buildings in this town date to the 18th century or later and many are in good repair. 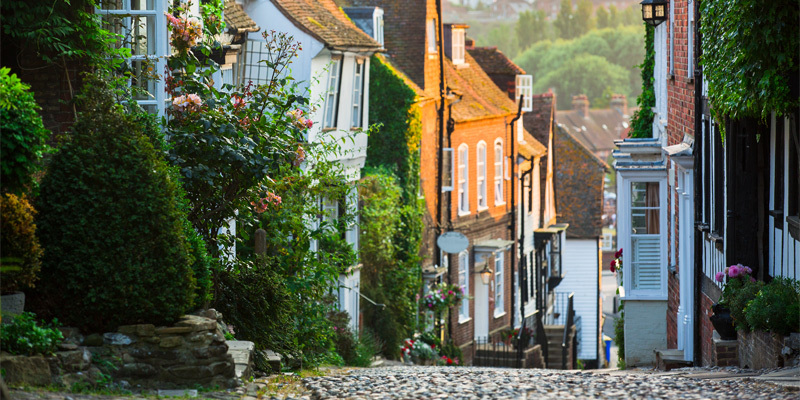 As Shaftesbury is so easy to access, it’s ideal for a day visit. Situated just an hour from London, Aylesford has so much to offer that you’re likely to find yourself visiting multiple times. Leeds Castle (once King Edward I’s favourite residence), Rochester Castle, Rochester Cathedral, Upnor Castle, and The Friars 13th century priory are a few sites where impressive architecture is the main attraction. Museums including the Royal Engineers Museum at nearby Gillingham and Guildhall Museum at Rochester make for fun exploration on rainy days. 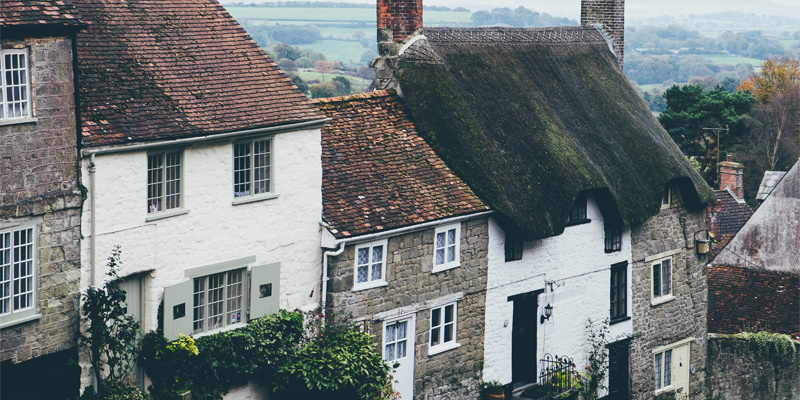 Don’t miss Kit’s Coty House, which dates back to 4000 BCE, and consider a family trip to Kent Life, which takes you through a variety of buildings that represent England’s agricultural heritage. Rye is just about an hour and twenty minutes from Brighton, and it holds the distinction of being one of England’s best-preserved medieval towns. With half-timbered houses perched precariously along cobbled lanes, it’s also home to a castle, historic inns, and Ypres Tower, where you’ll find a museum that covers nine centuries of area history. Take a walk on the beach, which fronts the English Channel, and see what you can find in the many quaint shops along Strand Quay. Climb the clock tower at St. Mary’s Church for a view of Rye’s ancient rooftops and the surrounding countryside. Fuel up at one of the many cafes or tea rooms along the High Street. If you opt for Ye Olde Bell Inn or the Mermaid Inn, be sure to look for traces of the secret passageway that once served smugglers who would go back and forth between the two. Bodiam Castle is just a short drive away, so consider a little side excursion while you’re visiting East Sussex.